2018 was a STELLAR year for Bust Buddies. 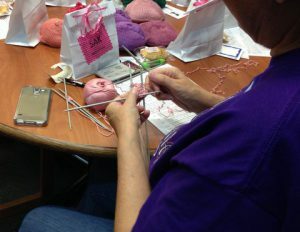 I attended Making Strides for Breast Cancer in October and 15 dozen pairs of Buddies were given to women and their care partners, so heartwarming, but none of this would be possible without your help. It was a very moving and exciting day. I’m planning to attend this year so think about joining me – it’s fun – up at oh-dark hour and meeting survivors that will inspire you throughout the year. The 2018 recipient of the yarn swift was Terri Miles who knitted 54 pairs of Buddies – that’s 4.5 dozen pairs. Thank you, Terri! We had many other thank you gifts to share as well. This year’s big winner will receive a Boye electric yarn ball winder. I bet you’re thinking – do I really want or need that? The answer is YES! 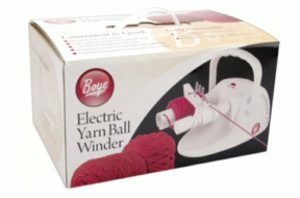 It’s easier to wind hanks of yarn, the center pull cake is really a flattish cake, so it fits more easily into project bags, it will wind yarn from a swift (no more cranking by hand), and it’s fitted with suction cups so just about any smooth surface will work. I knit or crochet for philanthropy at every guild meeting setting aside those two hours each month because It’s a nice break from my on-going projects. Just imagine what the guild could create if we all tried this, even for one month!